Young and beautiful Julia Lawrence. JULIA Lawrence (Nee Thomson) was born in Brisbane on July 6, 1928, the second child of Arthur and Isabel Thomson. It was during the time of the Great Depression. She was educated at Camp Hill State School, and Brisbane State High School when it was the only academic state high school of its kind in Brisbane. She was admitted to Charters Business College and was then able to enter the Commonwealth Public Service in the Department of Air in Brisbane. The Second World War was on and this Department paid all the air-force personnel in Australia. She was there when the war ended, and everyone flew out of their Brisbane offices and danced in Queen Street. The Department of Air disbanded and she took a position with the Taxation Department. 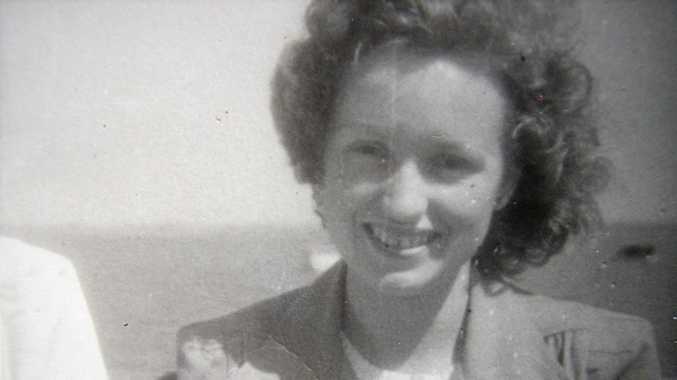 Later she took a position in the pay section of the Department of Civil Aviation and later again she worked for the Department of Works and Housing in Darwin, Northern Territory. Her recreation pursuits included tennis, table-tennis and ballroom dancing. She won the Northern Territory table tennis championships in about 1951. She believed if people wanted to make a difference, they had to speak up and be counted. As the second child of a family of seven children, she learnt to care for and organise others. Ron and Julia Lawrence in their youth. 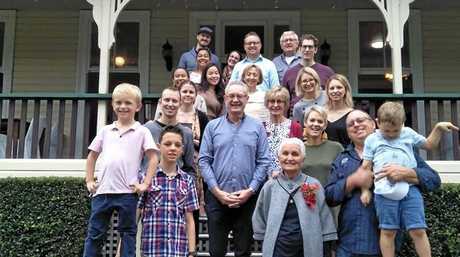 She had met her husband Ron Lawrence in Brisbane when they were 16. Ron was a boy scout and Julia's school friend's father was the scout master of the troop. 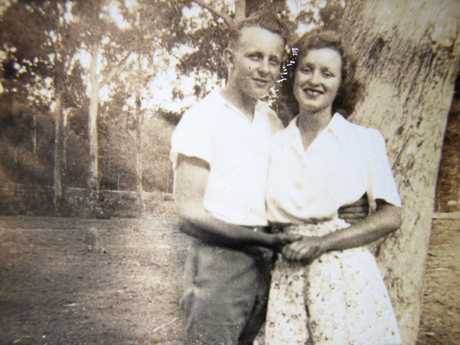 They were married in 1951 while both were working in Darwin. Ron was a fitter and turner in an engineering firm and Julia worked for the Department of Works and Housing. Her appreciation of music began at an early age with the weekly family music nights. She joined the Gympie Musical Union when she came to Gympie and enjoyed being in the musicals produced by Brian and Margo Goldburg. Julia involved herself in Red Cross, Forum, the children's schools and sports clubs, Scouts and Guides, and religious and cultural activities. She was involved with the Queensland Ambulance Transport Brigade when Ron became Superintendent. The family lived at the Ambulance Centre house in Nash St. Wives were expected to run the centre if all the staff were out on jobs. She took phone calls, answered the door-bell and the two-way radio and washed the dirty linen used in the ambulance vehicles. There was no pay for Ambulance wives. The Q.A.T.B committee allowed her to run disaster appeals from the centre for Red Cross and her yearly Christmas appeal for disadvantaged people was made easier by the staff taking in contributions. Julia helped initiate many support groups in Gympie and was always proud of her contributions. In the early days she was able to work closely with social worker Bernice Julius of the Social Security Department in Gympie. Ms Julius formed the Gympie Community Services Association and Mum was an executive member of that committee. Domestic Violence cases were not taken very seriously by the authorities, so the committee took up the cause. Until the committee managed to physically provide the Women's Refuge itself, Julia on occasion, had to hide women until they could be taken out of town. She used the Red Cross Rest Room and her home to house a few. There was no government subsidy for the committee in the beginning and volunteers Faith DeVere and Julia personally raised two years rent for the accommodation by weekly raffles. Julia was one of the 20 foundation members of Zonta Womens Service Club. 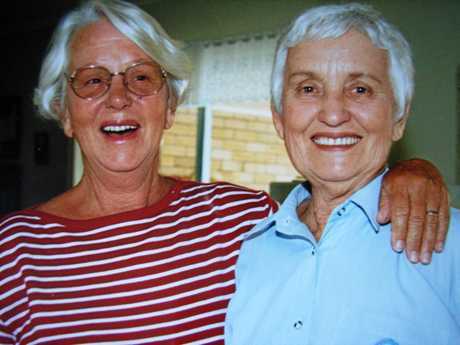 Penny Campbell Wilson, secretary to elected State Government member Len Stephan, found 20 women in Gympie willing to join and the club met regularly. She worked at a few paid jobs including a doctor's receptionist, in a chemist shop, at Madills as well as doing the Commonwealth Government Statistics for eight years. 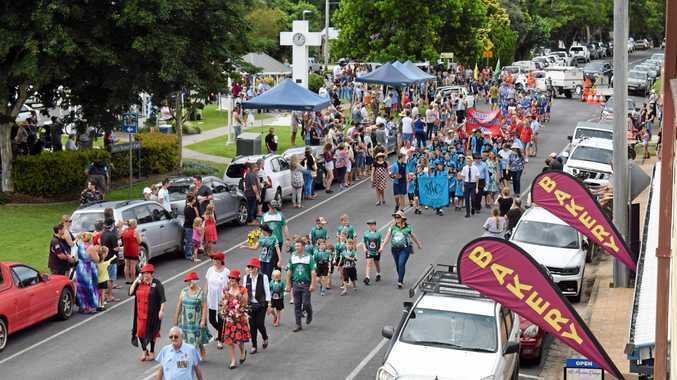 She was encouraged by a fellow member of the Gympie Forum Club to stand for the Gympie City Council elections in 1976 and topped the poll in the first two elections. She subsequently became the first female Deputy Mayor and this opened many doors to her. She was able to promote Gympie at conferences and other opportune places in many parts of Queensland. During her years on Council she served on all the committees and gained a great insight into local government and life in the community. 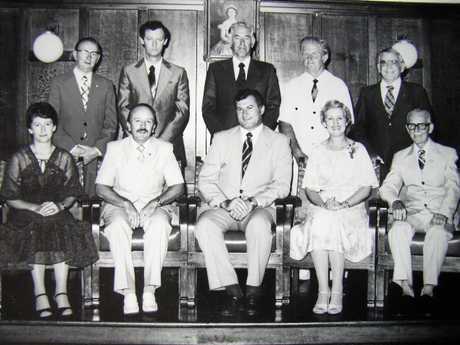 Later the Gympie Health Liaison Group was formed by Mayor Joan Dodt as part of the new Regional Health Authority. Julia became president and successfully led the lobby for the mental health friendship program later called Choice Support Service. Further lobbying brought the professional Mental Health Service to Gympie - all of which are still operating. Julia was recognised for her community involvement with an Order of the Medal of Australia (O.A.M), a Paul Harris Fellowship Award by Gympie Rotary Club, a Citizen of the Year Award by the Cooloola Shire Council and had good support from the community at five council elections. She decided to not stand again after 1993 as her family deafness was getting worse and she said "she was tired of arguing with men every day". For 14 years her days began at 6am and continued until midnight. She sewed clothing for the family and did her own housework and gardening too. She was pleased to be in Council to help achieve the TAFE centre for Gympie, be involved with the building of the Civic Centre and the Senior Citizens Centre, Woolworths, and many others. Her involvement as secretary of G.S.H.S P&C Association involved her with the building of the gymnasium. To the end of her days Julia involved herself with community doings and had a special feeling for the people of the region. She encouraged them to be positive and to get on with life and thought of them as part of her extended family. After she left Council she worked as a trained volunteer with the Gympie Cooloola Tourism. Whenever she was taken somewhere, she took some Gympie Tourism brochures with her and returned home with a selection of tourist brochures from the towns she visited. She served on the Gympie Regional Council Heritage Advisory Committee and produced the Rifle Range NHW newsletter. Only last week in her hospital bed at the Sunshine Coast University Hospital, she was telling her daughter Robyn, what needed to be done for her last newsletter. She kept abreast with community doings through the papers and radio and TV. 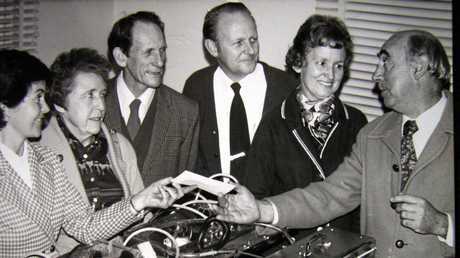 She especially paid tribute to The Gympie Times who made her work easier and took notice of what she was doing. She enjoyed contributing to Letters to the Editor and was willing to have her say. She said that she was proud of her husband and children and the grandchildren who work so hard to achieve. Her only annoyance was that she had to grow old. Julia Lawrence at her 90th birthday celebrations at Gunabul in Gympie last year. The following are some of the words put together by Julia, to be read out at her funeral which will take place at Gympie Funeral Services at 10am on Monday, April 15. "When I look back on my life I consider I have been very lucky to have been born in 1928 and experienced the Great Depression, been an 11-year-old when the World War 2 started and experienced life in a family of seven children with two parents. My experiences gave me empathy with community support in later years. "My husband Ron and I were fortunate to produce five children who are all successful in their jobs and who support community needs as needed and rear children of their own . Our wish for them is to be honourable people and to be kind to others. They were expected to get a job and to not get into trouble with the law. Our grandchildren are productive, educated, and likeable young people and any outstanding attributes I claim come from myself ha ha. "I still miss Ron and I see him every day when I open up the computer, as a family photo greets me on the screen. That photo has probably saved me from a lot of grieving. "I am thankful to the Gympie community who elected me to the Gympie City Council and to all the people who let me try to make a difference. And thanks to the Gympie Times who supported me for many years by publishing my works and organisations I was trying to assist. "My medical advisor Dr Jane Woodward supported me in my last years and I thank her for her kindness and friendship. "Thanks to my family who have kept an eye on me and provided assistance in all matters - Gary, Diane, Andrew and Jason and their families - and special thanks to daughter Robyn who gave up a lot of her life to see to my needs, thus making sure my life ran smoothly. "Thanks to Sue Topalov, Evelyn Aldridge and Liz Dixon who regularly visited or took me shopping, and many others who offered their assistance. And a special thanks to neighbours Dawn Doyle who crossed over from her house to pick up my daily newspapers and put them at my front door within easy reach, her husband Les Doyle who looked after my wheelie bins for garbage collections. And Graeme Moore and his wife Kay who bonded with Ron and me as part of our family. It is a pity we have to get old and fade away but at least the younger ones have a chance to take over and hopefully do a better job. So I wish them luck and compassion. "Do not grieve my passing as my body defeats me and it is time to go."